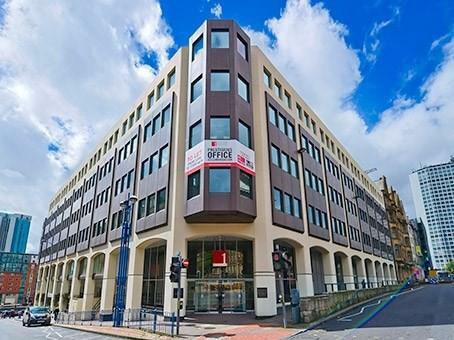 Located in a refurbished landmark building at the centre of Birmingham's prime central business district, the Regus Birmingham Victoria Square business centre has views across Victoria Square to the stunning town hall. This centre has 10 meeting rooms and conference suites seating 4 to 50 people. The West Midlands meeting room seats 12 to 50, the Shropshire room seats 14 to 20, the Warwickshire room accommodates 4 delegates and the Leicestershire room with its vibrant red and blue décor seats 10. The centre also has day offices and a business lounge and benefits from air conditioning, disabled facilities, reception staff and support teams, kitchen areas, shower facilities, WiFi and state-of-the-art technology. Victoria Square has beautiful water fountains and modern sculptures such as the Iron Man statue by Antony Gormley. All the city's amenities are within walking distance and the office space is near the entrance to New Street train station. Colmore Row Business District, Birmingham Cathedral and the Bullring, Europe’s largest shopping centre, are all within walking distance. This location also has easy access to the A38 and the motorway network. Birmingham has a sizeable service sector and is the largest centre in Great Britain for employment in public administration, education and health. Property reference 1075. The information displayed about this property comprises a property advertisement. OnTheMarket.com makes no warranty as to the accuracy or completeness of the advertisement or any linked or associated information, and OnTheMarket.com has no control over the content. This property advertisement does not constitute property particulars. The information is provided and maintained by Royal Estates - Bearwood. Please contact the selling agent directly to obtain any information which may be available under the terms of The Energy Performance of Buildings (Certificates and Inspections) (England and Wales) Regulations 2007 or the Home Report if in relation to a residential property in Scotland.